I’ve been searching for the perfect bar cart for quite some time. I had my eye on this one from Society Social, but really couldn’t justify spending over $500 on one. Fortunately for me, Target came out with a similar version at a much more affordable price point, just in time for holidays! Entertaining plays a major role during the holiday season, whether it’s a casual get together with friends or a formal Christmas party, so it’s important to always have a well-stocked bar cart. 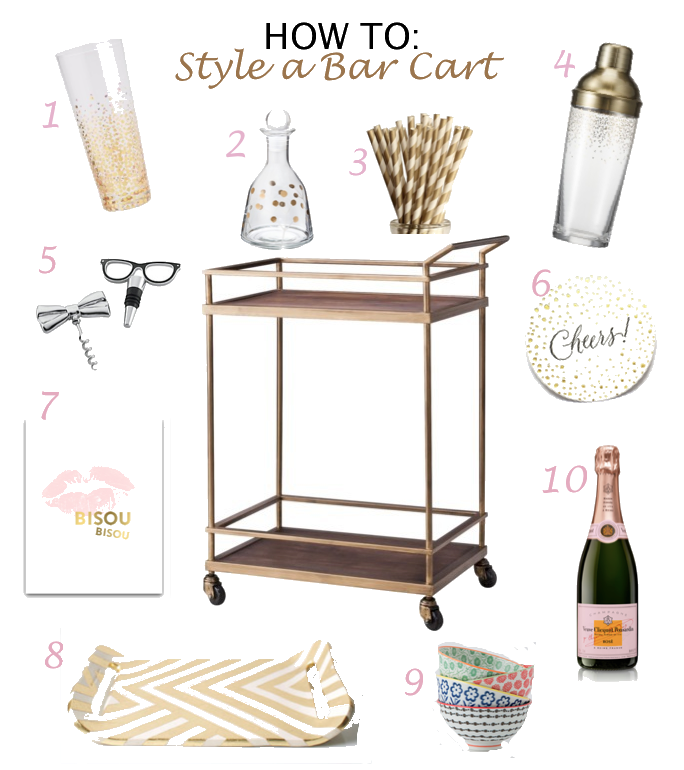 I put together a guide of my favorite bar cart essentials, both useful and stylish, that will help you entertain with ease. I can’t wait to put my new bar cart to use this holiday season! 1. Bubbly Gold Champagne Flutes– These festive flutes are perfect for breaking out the bubbly, but can also double as a traditional cocktail glass since they are stemless. 2. Brass Cocktail Decanter– I love the gold dots on this decanter! It’s a stylish way to display your liquor. 3. Festive Party Straws– I’ll use any excuse to drink out of a festive straw. You can switch out the design or color to match the occasion. Gold is a classic pick for the holidays. 4. Threshold Cocktail Shaker– Every bar needs a cocktail shaker! This matches my decanter. 5. Kate Spade 2-Piece Bar Set– This bar set contains all the essentials needed for serving wine. It includes an opener and stopper. Plus, it’s adorable! 6. Coasters– Nobody likes a wet napkin. These coasters are a stylish way to protect your furniture from sweaty glasses and also provide a nice placeholder for your guests. These Cheers ones are great for holiday celebrations! 7. Festive Print– A festive print sets the tone for the party and adds a chic display to your cart. SS Print Shop makes prints for all occasions and you can switch them out whenever. 8. Tray– Trays add some organization as well as a design element to your cart. They are great for displaying items such as napkins, coasters, and fruit. 9. Atom Art Bowls– These bowls from Anthropologie come in such a cute designs. They are great for holding fresh fruit, salt, or even bar tools. 10. Bubbly- What’s a bar cart without any alcohol? Make sure your cart is stocked with at least 2 types of gin, vodka, rum, whiskey and a red and white wine. This way your guests have options. I always like to have champagne chilling for those unexpected celebrations! Great article! Can’t wait to use your tips in my new apartment.